Paris Saint-Germain’s 2-1 victory over Lyon surely presented itself as a a measure of relief for the hosts’ embattled manager, Unai Emery. Bruno Genesio’s Lyon had been on a tear in the league, punctuated by a 4-0 thumping of Toulouse the previous weekend, and even after an exhausting victory over Roma in the Europa League, they seemed to be set to provide the Champions with a stern test. That was far from the case, however, as Lyon offered little in the way of resistance, Genesio’s tactical and personnel selections looking poor from the outset. The manager wasn’t wholly to blame, though, as Lyon’s players deserve some culpability for their lack of positional discipline. Other than Javier Pastore and Adrien Rabiot, though, none of PSG’s starters acquitted themselves particularly well, their victory being down more to a lack of focus on the part of Lyon, an issue likely exacerbated by the pressures of their European matches. These first two images show both sides’ initial formations, which are not quite as advertised. 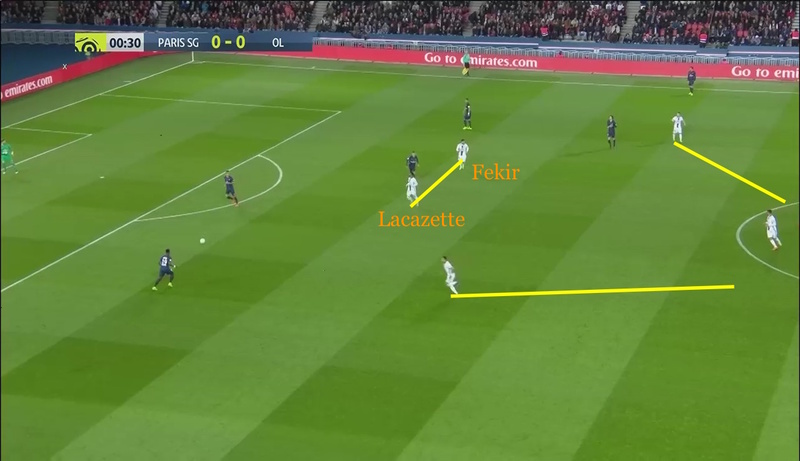 Lyon were supposedly playing a 4-2-3-1 with Fekir as an attacking midfielder and Lacazette as a lone striker, but given Fekir’s lack of willingness to track back, the formation functioned much more as an orthodox 4-4-2. Indeed, it was Lacazette who actually bore much of the responsibility for tracking back, a less-than-ideal situation given his exertions on Thursday, and may have contributed to his coming off injured early in the second half. Without Fekir acting as a creative force, that also had the knock-on effect of forcing both Mathieu Valbuena and Depay infield, to facilitate play themselves. 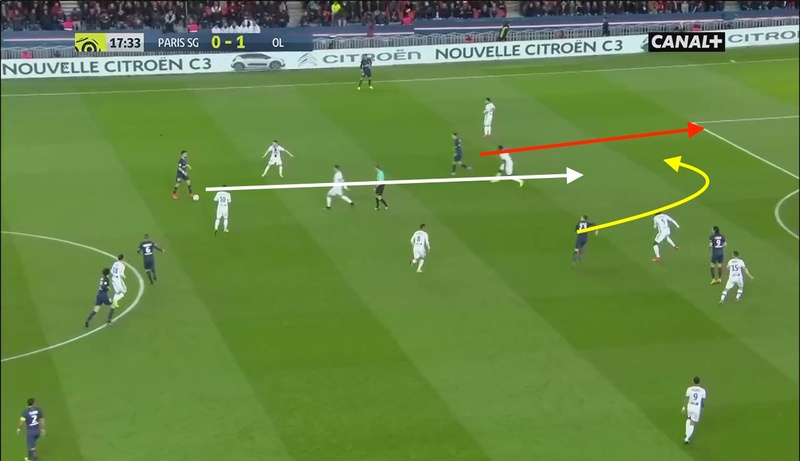 This not only limited the two wide players’ ability to track the runs of PSG’s fullbacks, but also denied Lyon the opportunity to stretch play, particularly on the counter, where they are at their most deadly. 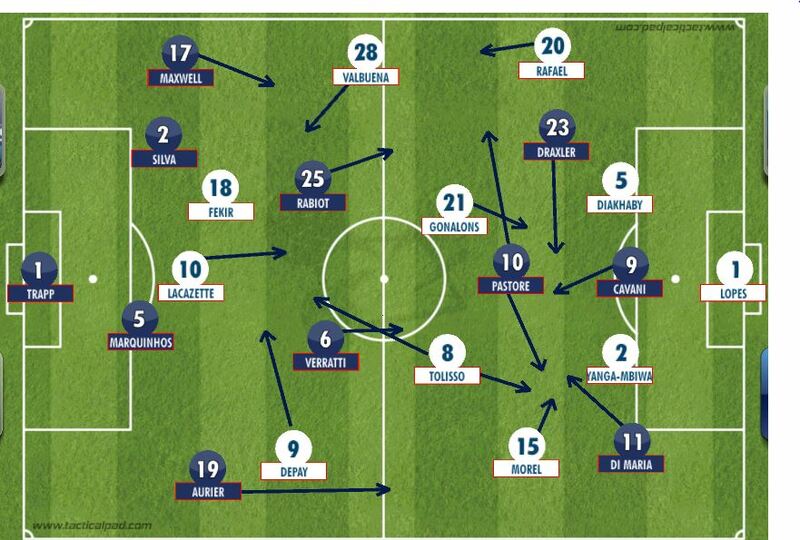 PSG, too, affected something different than their usual 4-3-3. Earlier in the season, much was made of Javier Pastore being given Zlatan Ibrahimovic’s no. 10 shirt, given his injury history and attendant doubts over his ability to be the team’s attacking nexus on a regular basis. Indeed, those fears were soon realized; Pastore was making his fourth consecutive start in the league, but prior to his current run in the starting eleven, he hadn’t featured since late February. 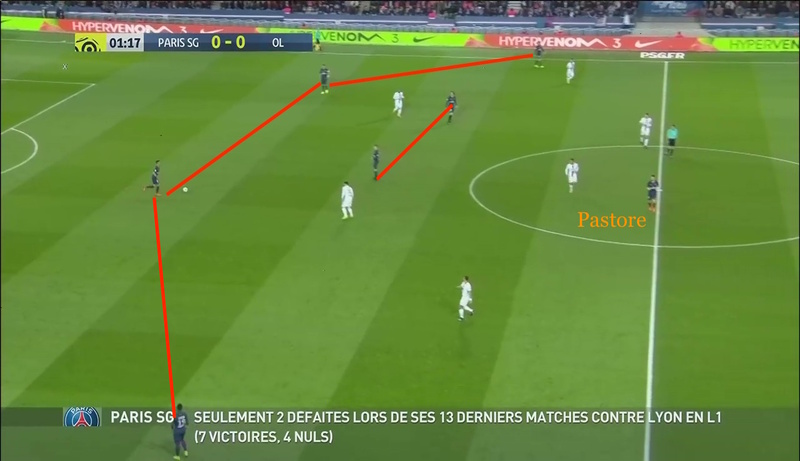 In this image, Pastore takes a central role, something which he is entirely comfortable doing, but as we shall see, he was also quick to pull out to either flank or drop deep to allow Rabiot or Verratti the chance to get forward, consistently causing Lyon headaches on the night. Some of the headaches, however, were self-made on the part of the visitors, as this trio of images shows. Pressing Paris Saint-Germain is easier said than done, but Lyon generally made a mess of things, even as they initially took the lead. The first image, from early in the match shows PSG in their 4-2-3-1; Verratti has the ball at his feet, and Rabiot is close to the little Italian to offer support. 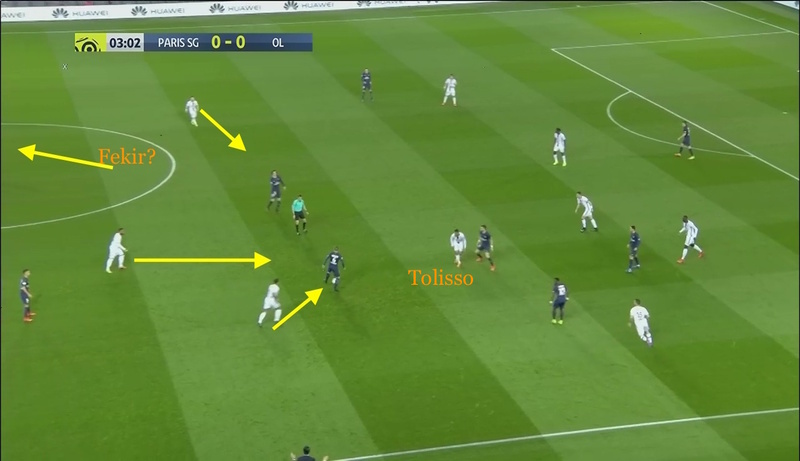 Tolisso does well to guard against a pass to Pastore, but Lyon’s attack quartet have done little to aid Tolisso in creating pressure. Lacazette, Depay and Valbuena have at least dropped into their own half, but Depay, rather than tracking the run of Aurier, has cut inside, towards Verratti. Fekir, meanwhile, despite supposedly being deployed in attacking midfield, is nowhere to be found, leaving Lacazette to thus cover more ground, despite having played a difficult match against Roma in mid-week. As Genesio wanted Lyon to press the ball, however, Lyon became increasingly stretched in responding. Here, as Fekir and Depay stand about idly, Maxwell plays a long ball (yellow arrow) to Cavani, being defended by Diakhaby. It would normally be a good thing to see a center back so high up the pitch applying pressure, but the issues created are apparent, as Tolisso and Gonalons have also pushed up, compensating for the lackadaisical pressing of their teammates. The two midfielders are seeking to close down the space between PSG’s back line and midfield, but this leaves the young center back in a dangerous position. This says nothing, further, of Di Mariá, who is in acres of space centrally. Yanga-Mbiwa and Morel presumably lurk just out of the frame, but the Argentine’s pace would be more than a match for Lyon’s defenders. In the final image, Lacazette and Fekir are showing a bit more attention to the ball, but in only meeting Rabiot at the centre circle, the floppy-haired midfielder is afforded too much time to pick a pass to Maxwell or Pastore. Thus, allowed too much time on the ball, PSG were allowed to pick Lyon apart at will, essentially playing on a shortened pitch. Having previously mentioned the effectiveness of Pastore, an example of his slide-rule passing should also be brought into the discussion. Marco Verratti is also a good passer of the ball, but the feeling is that when he gets forward too often, the defensive midfielder is either left exposed or unable to themselves contribute, no small matter when said midfielder is Rabiot. Adding Pastore to the midfield may lessen Verratti’s involvement going forward, but he more than makes up for it with his vision and inventiveness. In the first image, Pastore has the ball at his feet, and is preparing to make a pass (white arrow) to Di Maria, whose run is indicated by the red arrow. 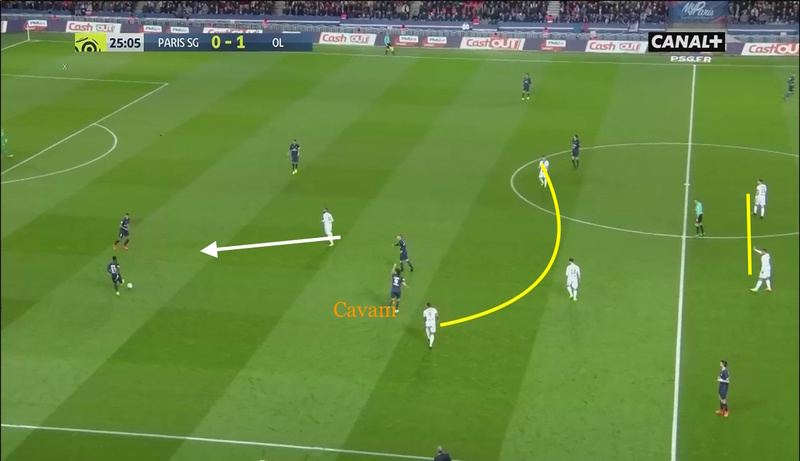 But, another wrinkle is added by the run of Draxler (yellow arrow), the whole sequence a testament to the positional flexibility of PSG’s attack. In the second image, we see that Draxler’s run has him, not Di Mariá, pick up the pass. This allows the Argentine to pick up speed, running past him on the outside (yellow arrow) before picking up the ball in full flight in the area. Here, Yanga-Mbiwa has done well to track Di Mariá’s run, but the move has effectively absorbed Lyon’s entire back four, with Rafael and Diakhaby attempting to react centrally and Morel (near side) running away from Cavani to challenge the Argentine. 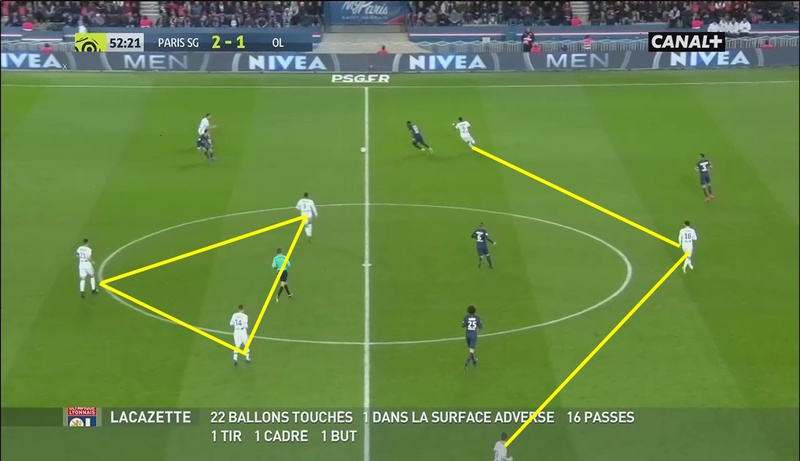 Now, the precision needed to execute this sort of sequence isn’t something that can be counted upon every time PSG are in possession, but it does serve as a fine example of how just a bit more vision, in the form of Pastore, can improve their ability to stretch defenses. But it’s not only Pastore’s passing that adds another dimension to the champions’ style when he is fit. Despite being nominally a central playmaker in this match, Pastore also took full advantage of the pace and versatility of Di Mariá and Draxler to wreak havoc with Lyon’s defensive shape, being as liable to pop up in a wide area as either of the two nominal wingers. In the first image, he has pulled wide to the right, with the rest of the team stopping at the edge of the area. In doing this, he has drawn Diakhaby with him, the big centre back better able to cope with his strength than Morel. That leaves the left back to cut inside to cover Diakhaby’s position, with Cavani lurking at the back post. Lyon look decently well-positioned in the first image, but the second shows how torn apart they were, with Rabiot and Draxler unmarked. 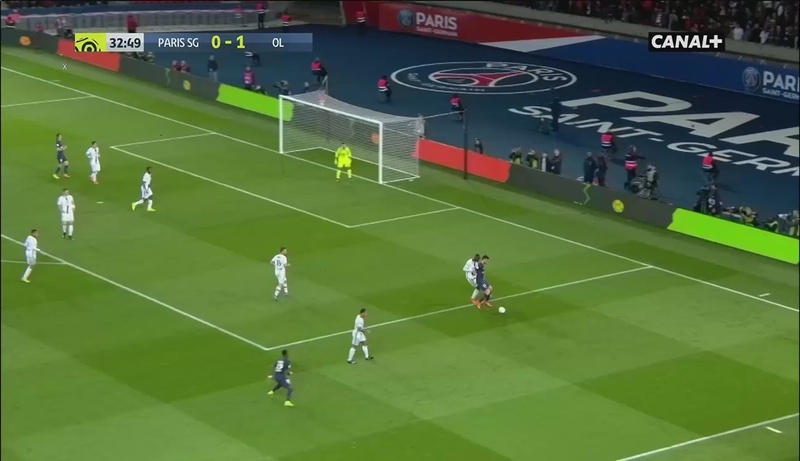 Fekir and Valbuena have failed to track back to cover the pair, and Rabiot was left with a tap-in for PSG’s opener, all created by Pastore’s movement. While the previous images make it seem as if Lyon were poor in every phase of play, that’s not exactly fair. This image shows what the team should have been playing like all match, hewing to a the prescribed 4-2-3-1 to put an extra player in central midfield. On the right, Gonalons and Tolisso have pushed up towards the centre circle, while Fekir has dropped close to them, with Depay and Valbuena’s positioning a bit wider than usual (yellow line). Lacazette (white arrow) can then pressure PSG’s defense without having to worry about running the entire length of the pitch. Too, Cavani has dropped deep to provide an outlet for a pass. PSG certainly retain their width through Draxler, Di Mariá and Pastore, but with the big striker otherwise occupied, the hosts thus lack an aerial target. Lacazette, though, found the going tough as the match progressed. Tracking back on Rabiot in the first half, the striker seemed to grimace, and he looked off the pace for the rest of his time on the pitch, eventually being replaced early in the second half by Sergi Darder. This saw Lyon play a much more organized 4-3-3, which ended PSG’s numerical superiority in midfield as Gonalons took a deeper role, allowing more freedom to Tolisso and Darder. Fekir, too, asked to play as an orthodox striker, was less dead weight in defense, even if he failed to affect things offensively. The solidity Lyon showed in playing this shape begs the question over whether they shouldn’t have used the formation from the off, with one of Darder or Lucas Tousart coming into midfield, with either Valbuena or Fekir dropping out. One can understand Genesio’s thought process in wanting a surplus of attackers on the pitch, but their lack of willingness to put in a shift tracking back was ultimately the visitors’ undoing. PSG were also forced into a change, with Julian Draxler being removed with a thigh injury not long after Lacazette. Blaise Matuidi came on for the German, and while Matuidi has played wide on the left in the past, his lack of dribbling ability or crossing makes him a less than ideal situation there. 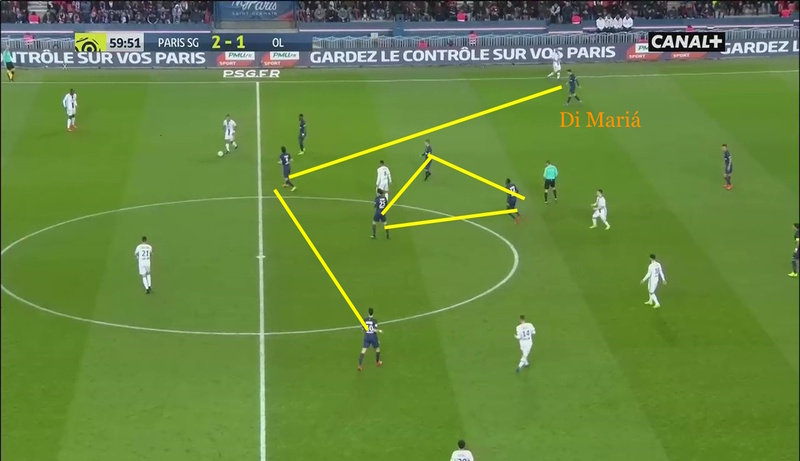 Again, though, the adaptability of Pastore was instrumental here, as the second images shows Matuidi playing as part of a compact midfield trio while Pastore takes a position wide on the left. Thus, Emery was able to make a change in system smooth indeed, without sacrificing his team’s solidity, perhaps even enhancing it, yet another positive surrounding Pastore’s return to fitness. As a coda, PSG do deserve some praise as a team, even if Lyon didn’t offer as much as most would have anticipated. Lyon have demonstrated a proclivity for late goals this season, having scored a larger portion of their goals in the last fifteen matches than any other team in Ligue 1 save Monaco. 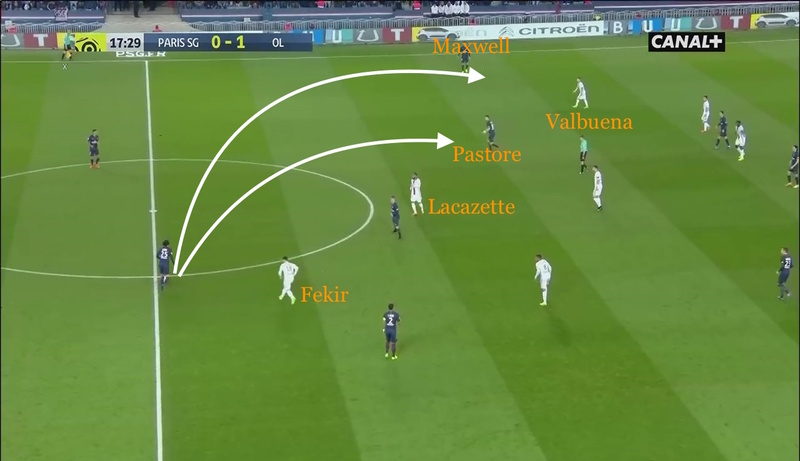 Wary of that, PSG showed perceptiveness on Emery’s part, as their shape, particularly after the introduction of the speedy Maxwel Cornet, looked more like a 4-5-1 than a 4-3-3. Rabiot and Verratti remained as a central axis, but Pastore and Di Mariá (and Lucas when he came on) played deep (white band), allowing Matuidi, fresher than any of them to join Cavani in pressing Lyon’s midfield (yellow arrow). It was surprising to see the champions adopting a negative approach, but it was also an acknowledgement of the new reality of Ligue 1, no longer a hegemony.